I was back at Lafayette Village today. Got a cookie cup of coffe from Upper Crust Bakery. Real nice place, seemed busy too. The goutmet market looks like it will be open soon. Poked my head into the village pub .... looks cool. They have a real nice bar and a 120" HDTV that will be amazing to watch sports on. I grabbed one more photo today that I thought was interesting. Never expected to see this in North Raleigh! Wow, I'm not usually a fan of these types of things and find them too Disney as well, but I really like the architecture here. Although I'm picturing how nice it's going to be in 50 years, when people who love older architecture will love this too! Very nice. 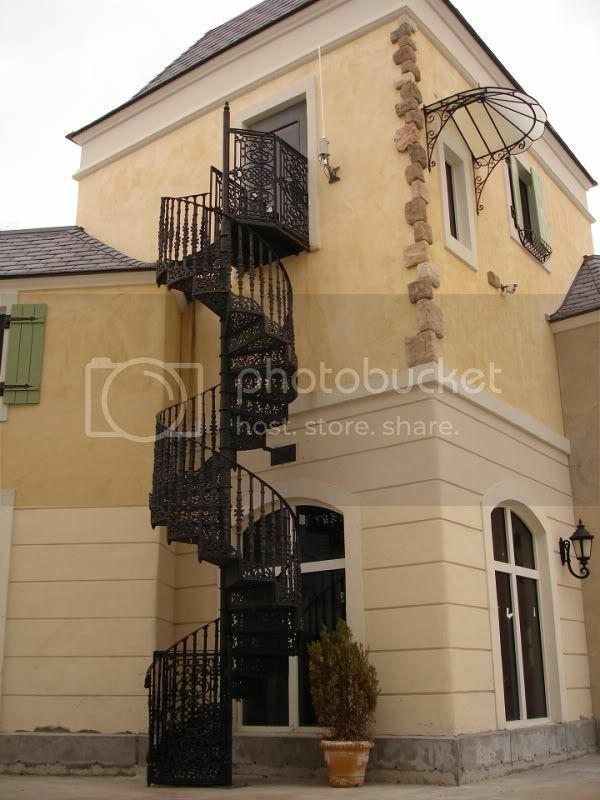 It would REALLY be Disney-esque if that beautiful wrought-iron spiral staircase ended at a fake door. I hope it does well as I hate to see a small business fail but I have a feeling once the trendiness wears off people will move on to the next trendy shop. Take a look at Falls Village shopping center on the Chik-Fil-A side. Got remodeled with a trendy look, business was booming for a while, now the trendiness is gone and spaces are vacant. I don't think it was the trendiness factor. I think it was the recession. I hope it does well as I hate to see a small business fail. Me too. The Upper Crust Bakery seems to be doing very well (it has been quite busy from what I hear and experienced during my visit). They seem to have a good concept. The Savory Spice shop also seems to have a good following. There is a lot of retail space to fill there. I think it is going to key to properly promote the center as a whole as many of the storefronts are in the interior and do not have street exposure. I think it serves a need since it is easy to get to from key areas of N. Raleigh. If executed well I think it could be a tremendous success, but only time will tell. There wouldn't be a recession if it weren't for the trends. The people who are into trends are the cause of the recession since they are the ones who overspent and didn't live within their means. I work next door to lafayette. we frequent upper crust. it is A+++ in terms of everything. it can get very busy, so please bare with them as they learn. they have amazing eats there. and desert. apparently paparazzi (or however its spelled) is open now. and i cant wait for the market. the whole upstairs is where they store their mechanical parts. all the AC machines and such. it was kind of neat watching them build in during the past few years. those stairs probably take it to the mechanical section. so in a way its "fake", but functional.